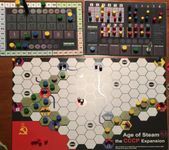 Age of Steam: Getting those Maps Played! Age of Steam has been my favorite game for several years now. For a long time, it was my only real "10" on the BGG scale (years ago, Magic was also up there; but I don't have time to build decks any more, or interest in adding to a Magic collection of cards that just take up space on the shelf). Twilight Struggle finally made it up there as well, and I do have several almost-10s (including Steam with "Base" rules -- what a stupid name!). 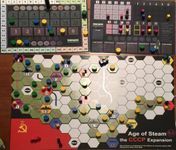 But Age of Steam stands out: it's a game, but really it's a game system with a core set of rules and nearly endless tweaks -- some little, some pretty huge, plenty in between. Sadly for me, I'm bitten by completionist bug. Back in the early '90s I spent thousands of dollars on Magic cards, until WotC's production schedule ramped up while my free time cranked down. Other than sporadic purchases, we stopped buying Magic cards by the case some time around ... Visions? 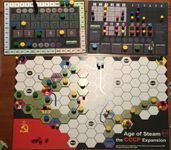 Age of Steam, however, has a much slower pace: expansions come out every year, but only a handful at a time; they are MUCH easier to collect! 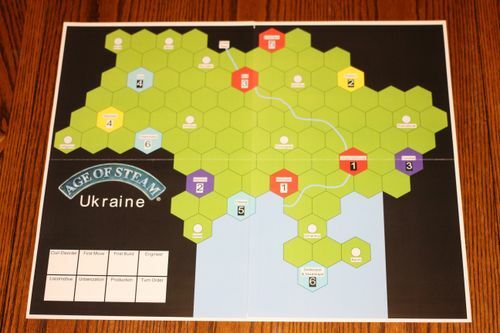 There are even print-and-play maps, many of which (apparently) work very well. Sadly, the game seems to be getting a lot less play these days. I don't have a regular weekly gaming session and we've hardly hosted any game days ourselves in quite a while. 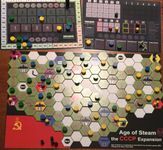 I tried to organize an Age of Steam specific group a few years ago, but stuff came up and we had not continued meeting after a few initial games. I eventually ended up playing online (PBW Steam and Age of Steam, but those groups have been largely quiet for a few years now. So all the expansions I had continued to purchase largely sat on the shelf unplayed. I even had one set of maps from last year that I thought I'd never received: I emailed Alban, one year later, to figure out what happened. Of course, later that day I found them on a shelf, still in their original mailing envelope! So maps have continued to pile up. Enough!! We have a local convention coming up and I've decided that, rather than playing all the latest and greatest, I'm going to try getting through some of these maps! I started by resurrecting that Age of Steam group: we met twice in the weeks before TBGT -- 4 maps down, countless more to go! 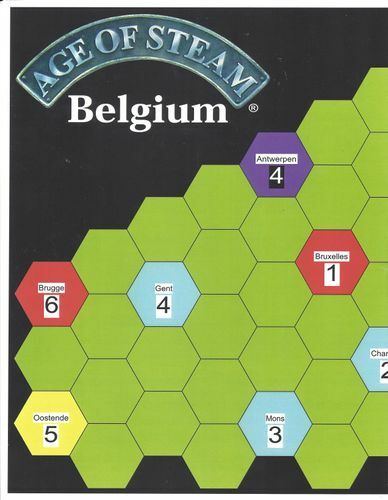 New maps bring up rules questions and calls for help on the forums here; a reply on one of these suggested a Geeklist ... so here is my attempt to respond -- we'll see how long I can keep this updated! The map was new to all of us. After such a long time since we'd played any Age of Steam, I thought this would be a good map with only one real rule change in a 4er game: polder terrain, inaccessible until turn 6 (actually, it turns out it's supposed to be turn 4 -- but there was an error in the English rules, which I didn't discover until much later!). This was a fun map! The polder really divided the board into tiny areas, completely blocking away the yellow cities until very late in the game. 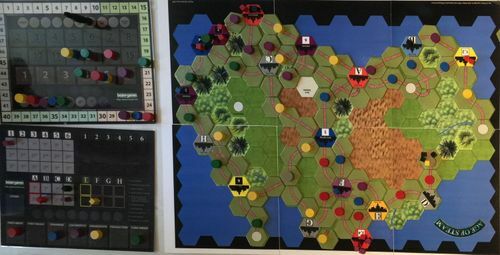 The center of the board becomes a knot of track as you try to create long routes, especially since the 3 red cities in the center each get double production! You need to prepare for the turn when polder becomes available, which is kind of cool! The turn before, we all built some incomplete links from those juicy polder-locked cities, trying to reserve a share for ourselves. I ended up winning this one ... yay me! With the correct rules -- polder available on turn 4 -- this would all have been less of an issue. More cubes, and more delivery targets, would have been available sooner. I'm not sure if that would be a good change or not, though, since I think we generally had enough cubes to deliver anyway; maybe that was just luck of the cube distribution, though. - all the actions are bad (last build, last move, etc.)! Wow, what a cool idea! You have to choose an action, but you're choosing the one you can tolerate the most, the one that hurts you the least. They force you to totally change your approach to the auction/actions. Loco is no longer a no-brainer, since you can't build; urb isn't necessarily good, either, since you can only build one hex; etc. -- this is definitely NOT for AoS newbies! Game play, though, wasn't quite as fun as I was expecting it would be: felt very limited in what you could do much of the game, but at the same time there seemed to be an excess of money: spending so little each turn (due to limited builds), we became profitable relatively early in the game. You would think bidding would be tough, but often there are several acceptable options (you mostly want to avoid being last or second-to-last). Still, I want to like this map ... it's just such a neat idea! I wonder if it might be better with 5? 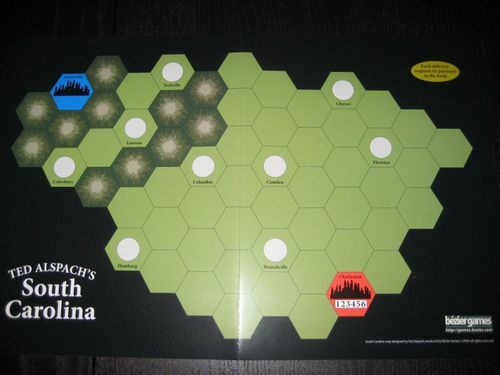 I printed this map many years ago, on the back of my Age of Steam Expansion: Scotland map. It is the oldest unplayed 2-player map I own. 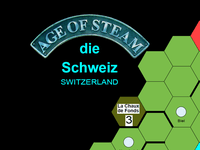 There are not really any new rules here (just the presence of a ferry), so it turned out to be a good choice: it turned out Earl had never played Age of Steam! This is definitely a solid map, especially to introduce people to the system! There were some questions not clear from my version of the rules, and one question still unanswered -- how much does 2nd player pay in the auction (we went with HALF)? 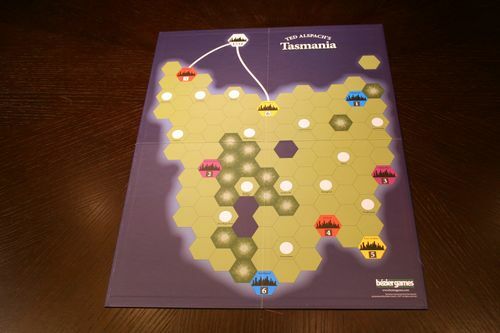 But the map works well: not too many cubes, not many new rules, quick to play, and retaining the feel of the full game. It's not necessarily a map I'd return too very often, but it seems like an excellent one for newbies! - may Urbanize over other cities! On the other hand, we didn't really use the urbanization until very late in the game: with cubes being so plentiful and cities so close, there didn't seem to be the usual need to use Urb to help build or to provide delivery targets. Early urbanizing would, of course, have reduced the cube supply. We also didn't use the Engineer role all that much -- there didn't seem to be any need to create additional links since so many are already on the board. I wonder if this might work well as a 3-player map? But after 1 play (even though it was with a newbie), it's not one I plan to return to any time soon; and only if I see comments from other fans suggesting that I'm totally wrong! Or should we call him Evil Dan? ... 1) move cubes (souls) from hell to earth, where they stay until phase 2 (cities in hell cannot accept cubes). No preset turn limit; ends when 20+ (of the 30 starting) cubes have been delivered. ... 2) move souls from earth to heaven; 2 turns only. The only cities on the map will be the ones people urbanized in hell, and they're placed in turn order. 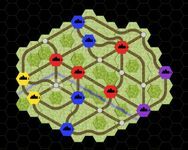 - you can build 6 tracks each turn, but only complete links! On the opposite end, we had LuAnn: she took a huge hit in income early on, dropping almost to bankruptcy. But she survived phase 1 with a nice network on earth; in phase 2, she made a huge comeback and ended up in a tie for second with Greg! Dan had a pretty big lead (earning a ton of points by building key links on the heaven map -- everyone was forced to use his tracks), but that was pretty cool to see. This was a really fun map. The main downside: it took 3 hours to play!! I'm not sure if the map is always this slow, or if it was just the player count, or if we just had a lot of slow play. We certainly had a lot of LONG turns, with attempts to negotiate who was going to do what, build where, etc.! I would love to play this again, but probably only in a 4-player game. I don't like going first, and yet I took a bunch of shares and bid high that first turn, so I could get loco. I think it was reaction to the previous game, where I didn't get the loco action until quite late in the game ... I hate that! I ended up starting in the SE, and being surrounded by everyone else except LuAnn; she was on the west coast all by herself for most of the game! I was incredibly unsuccessful in my attempts to create a loop -- got cut off on the right by Dan, and left by Greg; and then Ken horned in on the action, too! Dan had access to a bunch of cubes, but no good delivery targets. LuAnn was doing great at first, all by herself over there; but eventually ran out of steam/cubes (she ended up in 3rd place). Greg won the game -- did a great job creating a loop in the middle of the map, with tracks extending out to grab key cubes. (1) redirecting a track does NOT allow you to keep control of it. I thought that was the case, but Dan seemed so sure of himself! (2) Also, I think we let LuAnn start building on 2 different coastal cities. Maybe Greg started the game that way (but I don't think so)? (3) At the end, we may have forgotten the rule about not moving cubes through Rhodesia? Pretty fun map -- another keeper! On the Rust Belt map. 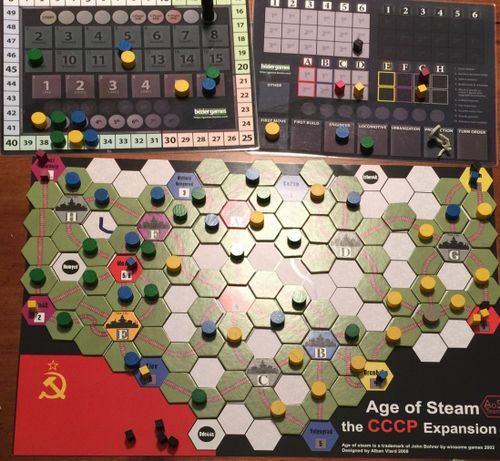 This was my first game at That BoardGaming Thing. I managed to get a group of four of us together, but a couple of people had not really played the game very much. In fact, one (Edward) had never played. David and Doug had played only a few games. So, I decided to try a map with very few rule changes. We went back to the Rust Belt map, but with the Hexpansion expansion. 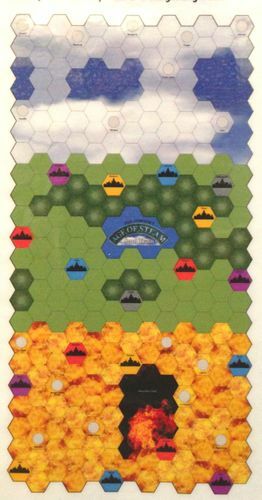 And this one, there are several new city tiles, each of which may have a different color distribution in each of the six wedges of the hexagon. A city is considered to be the color of the wedge through which a good is entering that city. Well, we sort of ended up playing two games. In the very first turn of the first game, I had planned on starting right where everyone else ended up starting. But being fourth player, and having everyone else start clustered close to one another, I decided to go on the west side of the board. However, the Hexpansion tile goodness threw me off. I failed to realize that I could not deliver the cubes that I was counting on and would in fact go bankrupt on the very first turn! So chalk it up as a win for everybody else. 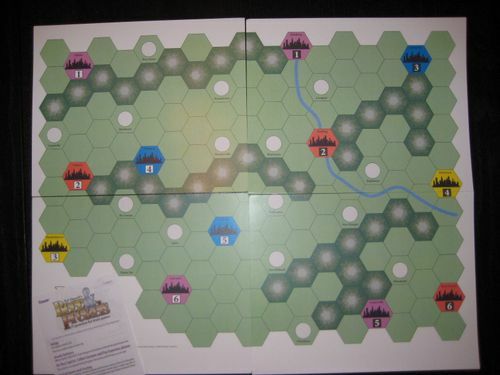 Or, a take-back for me: I had built last and wasn't competing for cubes -- they allowed me to rearrange my tracks so that I could in fact make the deliveries to the correct wedge of the cities! In the asterisked/second game, I was able to build a nice loop right in the center of the board. Bob, unfortunately, ended up competing with Scott from the very first turn. 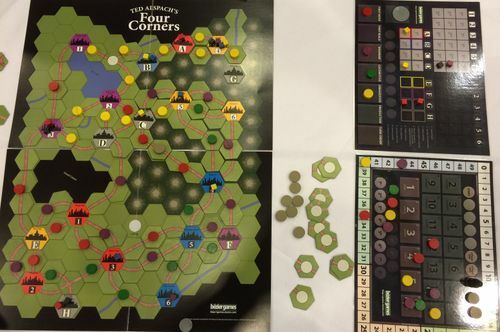 He was then forced to start a new segment of track in the far corner up in the Northwest part of the board. It took him quite some time to connect the two networks together, and in fact he spent much of the game messing with my moves. Or trying to mess with them, anyway. Edward built largely by himself on the eastern side of the map, while David largely controlled the center. 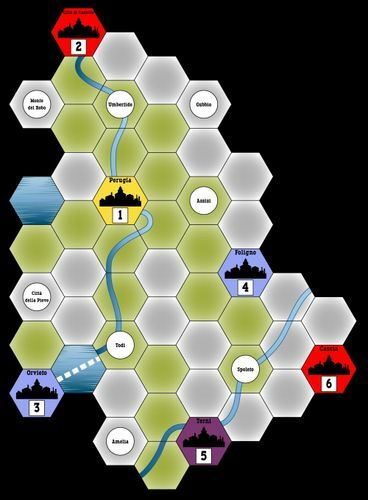 But in the end, the others couldn't keep up with me: my engine level ramped up more quickly, and I had a nice central loop with the cubes I needed. I'm not so crazy about this expansion map. It's an interesting idea, but it really is kind of strange. I like strange, so it might just be a matter of playing it more and getting used to it. But on the first play, it's difficult trying to see exactly where to build. Also, I simply placed the city tiles over the cities on the board matching the same number and oriented the same already present. 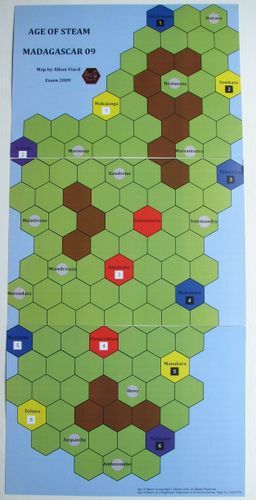 It might be more interesting if players took turns choosing the cities and placing them, as noted in the Hexpansion rules. In our game, for example, there was an odd distribution of cities with all the yellow ones on the east side, and blue on the west. This might get some play again, but probably not for a long time. There are plenty of maps already, and this might be a nice change of pace -- but only after having played a map MANY times; that's not likely on anything but the Rust Belt map! There were only 3 of us available (me, Josh, and Doug) so I brought this out -- my oldest unplayed 3er-only map. This may not have been the best choice, it turns out: Josh had not played much (or any?) 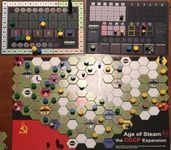 Age of Steam, while Doug has only played some (but has played a bunch of Steam). The board is a tiny little thing, and it fills up quickly. Because straights are so expensive, you end up with a mess of track winding around all over place -- it's hard to see what is connected to what! You also use a bunch of the short-in-supply tracks (sharp curves, complex crossings with curved track), which is rarely a problem on most other maps (and even here, may not be much of a problem until late in the game anyway). And because towns and cities are so close to one another, it's possible to create long deliveries fairly quickly in the game. With goods coming out so fast (same rate as usual, but concentrated into half the number of cities) you might even be able to make those deliveries throughout -- if you built the right connections, upgraded your engine, and can move them before the other players (who are also building right in your face) can do so! 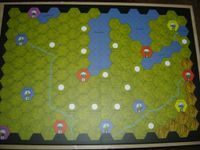 In a game with only 8 turns and many links, loco becomes especially important. Of course, Engineer and Urbanize are also nice since they help complete links more cheaply (especially Engineer). Unfortunately for them, Josh and Doug didn't keep up in that race and I was able to get my engine level up much earlier. I also had a nice loop going by the end, so was able to keep shipping for 5 or 6 each time. Overall, I kind of like the map -- but I don't love it, and it's not for beginners! I would like to return to this one at least one more time, but I'm not sure that it's going to be a keeper. My board and goods display (light cities 1-3) after turn 3. I went bankrupt the next turn. - Players each have their own board, which they keep hidden from everyone else. 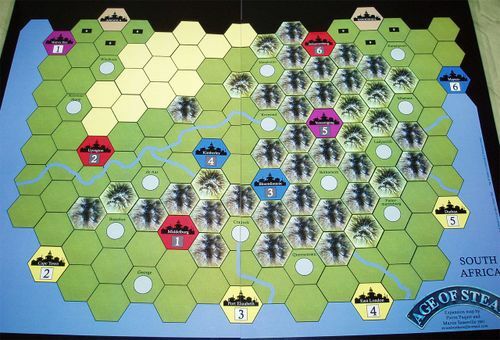 Each board has 3 cities (1-3 or 4-6, light or dark). 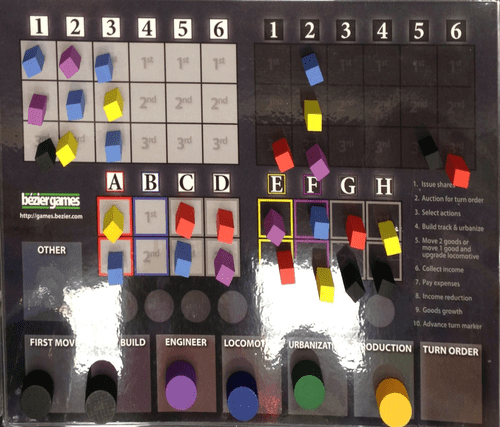 - After action selection (Turn Order, First Build, and First Move are not available) , players build track and move goods simultaneously on their own boards; simply announce the results -- how much you paid, which cubes you moved, income, etc. - Production is changed: you announce a color; if other players have that color cube on their board, they must give you one. You place all cubes received onto the Goods Display, and may REPLACE cubes already present! What an interesting idea! The only interaction with other players is in the auction, and with the Production action. That, the simultaneous builds/moves, and the shorter game length could make this a nice, quick map. But no so interesting in execution! It seems as if the initial cube draw has a HUGE impact on how you will do in the game. If you don't draw cubes you can deliver, you're in trouble! Goods Growth is also potentially a big problem: if your 3 numbers don't come up, you're in trouble! 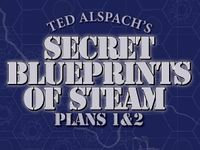 Plan 1 has pretty high build costs; if you don't get early deliveries you can start your death spiral right on turn 1 or 2! Urbanization, as a way to get a new color (and help reduce build costs) can become hugely, overwhelmingly important. The Production action can me much more useful here, which is a good thing; but it could also be quite an attack on the victim(s) if they were counting on making some key deliveries. I started this game with only 2 possible deliveries, one to each of the cities on either end of my board. Urb went for $10 or $11 on the first turn, which I guess I should've planned for but didn't -- hadn't taken enough shares to bid that high and be able to pay for the tracks I wanted. Then, over the next 3 turns, I got exactly ONE cube from the production rolls (the display is full because I chose Production to try to optimize my cubes)! I had to take shares just to pay for builds and interest, quickly getting up to the 15-limit without any significant income and no delivery prospects. In the meanwhile, people who had better initial cube draws were ramping up on income and had money to actually bid (generally for Urb). - weigh your columns of the Goods Display towards your 3 colors. - for Goods Growth, maybe have every player roll 2d3 each turn? 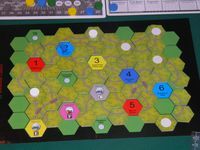 - rename Plan #2, which has much easier terrain, as Plan #1 so fools like me have their initial play on an easier board! I also don't like what this map takes away: you can't steal cubes from other players, or build track to block them! Both of these help balance the luck of the dice in a typical map; their lack amplifies the luck problems here. Maybe the time savings are worth that cost? Maybe, but only if there is something to improve game balance issues. Lynn ended up winning this one pretty easily. She had a good cube draw at the start, bid high for Urb and got her income rising early, and benefited from excellent rolls in Goods Growth (her part of the display, above, is empty!). No one else (and maybe not even she) thought much of this map -- YUCK! No more Age of Steam for me today ... need to forget this little experience! I was trying to get together with Jon again, but I was in a game of Archipelago earlier and ran late -- unbeknownst to me, he'd gone off to play something else! Justin, however, was available at the planned 1pm (actually, at the later-than-planned 1:30 -- Archipelago ran a bit long!). After failing to find Jon, Justin and I decided to just play a 2-player map. This is my last unplayed 2er, I think! 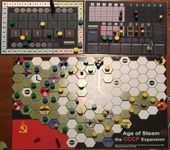 Justin hadn't played Age of Steam in about 5 years, so this ended up being a decent reintroduction (albeit with a lot of rule changes!). - roll 4d6 for production; ALL cubes go to Charleston! Justin bid VERY high on turn 1 and claimed the blue city in the northwest. I didn't make any deliveries that turn, but I did connect to Charleston. That turned out to be key: stuck in the NW, Justin didn't have as easy access to all those cubes as I did. Of course, that should have been obvious given the rules of the map -- but I don't think either of us appreciated it at first; we both just saw the red and blue cities, and the initial cubes on the board. We called it early, maybe around turn 4 or 5, when it was obvious my lead would hold. This is a solid map. I don't generally like blind bidding but it seems to work well here (and in his other maps using this mechanism). Charleston is crucial, and it would seem that both players need to build there right from the start, or maybe on turn 2? Early builds may, however, be disproportionately important if you can manage to make Charleston less accessible to the other player? Initial city placement also requires some long-range planning based on the goods distribution in the Display and your planned builds -- and I'm not so good at that, generally preferring more tactical play. It's hard to judge the map after just one play, but I think this will be a keeper though not necessarily a star. The end of our game. Justin and I had just about finished cleaning up when Jon showed up! He'd been by earlier, saw me immersed in my game of Archipelago, and gone off to do his own thing. His timing was almost perfect ... close enough, though, so we unpacked everything and I chose my oldest unplayed 3-player map: Switzerland. Justin and I started in northern central area, while Jon went northwest. That southeast corner seems pretty much dead, being largely inaccessible (except for a local network, which would hardly be profitable) until turn 5; even after then, though, we pretty much only built there for the track points. As you can see from the rail map above, our builds (directed by the map conditions) were true to life. Jon had early control of the NW rainbow city, but then spent resources (money, time) connecting to Zurich. With its guaranteed cube every turn, I guess it seemed important to him. Justin and I seemed to agree, too, although as it turned out we pulled a lot of cubes that just sat there until quite late in the game! My connection to the SW rainbow came somewhat late -- we were all fighting in the north earlier -- but was extremely helpful; with only blue cities en route (and color New Cities already placed), I could deliver a bunch of cubes from Zurich over 6 links! Justin also got his engine level up there, but ran out of good cubes (esp after I Urb-bombed with that black city in the middle of the board!) until he finally connected to Chur (SE yellow) on the final turn. I like this map, although the track builds are extremely constrained. it doesn't seem as if there would be a lot of variation in builds from game to game -- only in timing, depending on which cubes came out when. Three players was pretty tight; this must be REALLY tough with four -- probably end up sharing deliveries a lot more in that case. I do wish I'd done a better job printing this (I think my image is 2-3% shrunk, so the hexes don't quite fit), and they'd done a better job marking off impassable terrain! And I'm not sure how important the buy-back rules will be; we weren't in position to buy anything back until quite late in the game, and I'm not sure it made all that much of a difference? Maybe it did, though, since you could run out of space for tracks by the end and it's one way to eke out a few more VP with your cash. Definitely worth more play, although I may have to reprint my map with some altered art! 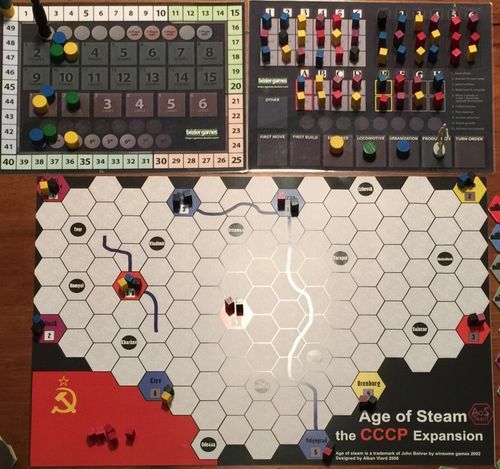 (I came home to see that this year's expansions from the Age of Steam Team had arrived!). to play one map at the Gathering. But one is better than none -- yay! 1. The vast majority of cubes come from Australia, that white hex at the top of the map. A bunch of cubes start there at the start of the game, while all other cities (except Hobart, the red in the SE) are empty! During the game, when a town is Urbanized it's cubes (from Goods Growth chart) also go there! And during Goods Growth, all cubes from light cities 1-4 also go there, too! 2. You must pay $1 cash for each cube you deliver from Australia. (1) gives players a pretty strong incentive to build in the north, while (2) punishes them for doing so! 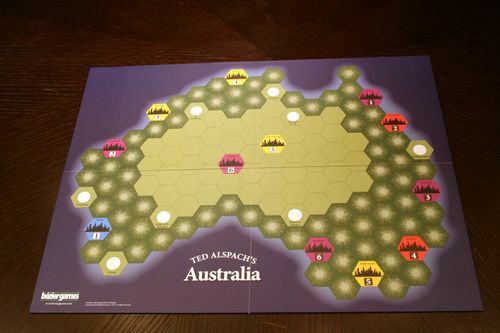 Our game started with an assortment of cubes in Australia, including ONE blue cube. Ryan started building in the NW. Unfortunately, Erin did so as well. That would've been okay, except that she chose to urbanize a blue city -- with plans to take that one blue cube I was counting on! But I needed that cube in order to avoid dropping back on turn 1 (or even bankruptcy? I can't remember). Any other urb, and I could've built in the central north so I also built up there! It was a tangled mess that Dan cleverly avoided, building all by himself down around Hobart. Most of the early game, Dan was all by himself and had cubes aplenty! Goods Growth produced a steady stream of cubes; more than I'd expected, really, given the emphasis on Australia. The rest of us were in more of a struggle, especially having to pay $1 for nearly every cube delivery! For a while it looked as if Erin might go bankrupt, but she was able to save herself from that! She did eventually break out of the NW and was the first to interact with Dan. Ryan and I also eventually built eastward, although he got further -- I was pretty focused on Australia. Being alone for so long, though, Dan was able to pull off a nice win. He kept his shares much lower than the rest of us, and had better cube supply and deliveries earlier. Despite him once bidding $8 (and making me spend $9) for Production! In this game, though, Production is not a totally useless action (but really, that was a crazy bidding round that made me burn through a lot of cash!). This was a pretty tough map, largely due to our starting setup! For four players, as you'd expect, one player cannot be left all by themselves! Maybe 2 in the NW, one in North central, one in S? Or 2 in S? Or maybe it's a tough map all around, even with just 3 players. I'd definitely try it again, although not necessarily before all my other unplayed maps! This is a tough map, especially with 5. And most especially with that Civil Disorder action -- wow, that's mean! We didn't really use it all that much, but it sure did hurt when we did. Even without that action, though, it just seemed like a relatively small map with not many cubes. I'd probably like it better with 4, but I'm not sure I'll ever be a big fan of the Disorder action. I'm glad to have played the map, but this is not one I need to keep! 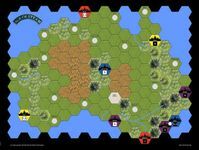 - Civil Disorder action (new option): at beginning of Move Goods, may choose a hex -- no cubes may move in or out of that hex! Finally, 5 months later, I get back to AoS! Every time someone activates this overtext, it takes a year off my life. Hover often please! 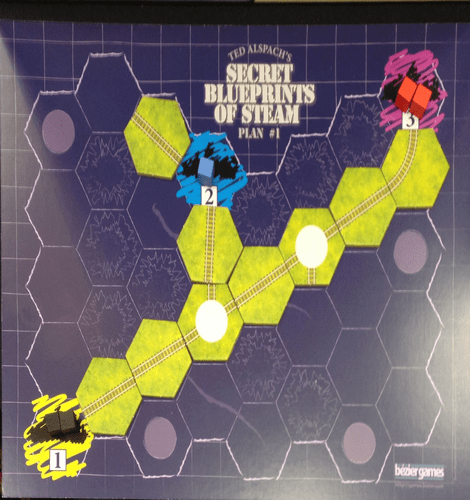 Last year, I was able to arrange plays of several Age of Steam maps at the local game convention so I tried again this year! I think everyone had played AoS before, although not necessarily very much? I thought this would be a good map because there are only a few rule changes -- it's really a pretty basic map. The biggest feature of this expansion is not the rules, which pretty much only add 2 things: 2 locations (zones) that can receive 5 cubes of any color, and a few preexisting public links that provide no income. Rather, it's the map: impassable hexsides abound (there are a lot of lakes in Finland?)! It's sort of like the Switzerland map but supporting more players. Unfortunately, it's been long enough that I don't remember the details of the game. And I didn't get a picture, either ! All of us started in the south, where all the cities are, so it got crowded very quickly! Strat built east-west to Russia and had a consistent set of deliveries early on ... but those petered out. Adam, from an early miscalculation, nearly went bankrupt in the beginning. Fortunately, though, he managed to save himself. I built in the south, seduced by cubes in that cluster of 3 cities. Initial delivers, though, were tough for me. I was eventually able to build north a bit, and had a decent (though little) loop earlier than the rest. I ended up winning, but not by much. Clay started in the SW, I think. He didn't get huge deliveries, but he saved money on bids, managed to move cubes consistently, and finished the game with just 3 shares. THREE!! A-MA-ZING! I suppose he would have had a harder time if we'd had more players -- and more cube poaching. Still, it was pretty unbelievable ... none of us had ever seen someone end the game with such a low share count! It's a solid map, but when looking at AoS expansions I don't like constrained track building nearly as much as I like other rule changes. It does change the auction quite a bit, though: first build and engineer become much more important. Turn order too, I suppose? I wonder if it would be better with 5 or 6 players? There would be more intense bidding, and more forced track sharing for cube deliveries. And surely no one would get away with just 3 shares! Oh, and were the hexes a bit too small? Or are the 3rd edition hex tiles too big? Once tracks were laid, we had a very hard time seeing the impassable borders on the board! In fact, nothing really fit ... it was just off enough to be a bit annoying! I don't know if it was the map, or the tiles, or both! Probably a 6 or 7 rating, for me? It's still AoS so 7, I suppose. Need to try it again ... if only there weren't so many other maps to try! (Thanks to this year's map purchases!). - tunnels connect boards on opposite sides of mountain; but not straight across ... weird! - moving goods from mountain-top origin to lowland destination earns +1 income; opposite direction is -1 income! Everyone started in the plains, but I was tempted by that +1 income and immediately built up to the top. Ted, Luann, and I were all on one side of the Alps, while Lynn went to the other. Unfortunately, she didn't have a good supply of cubes, didn't get her engine level up quickly enough, and had a hard time staying ahead of expenses (until later in the game, at least). Ted, and then Luann, did finally join me up on high, but by then it was too late -- all those +1 deliveries had already put me out front! - the box makes it hard to see the map on the other side! - the bonus/penalty seemed somewhat non-intuitive. I guess the justification is that the mountains are hard/expensive to get to, so bringing cubes down is worth more. But we also thought that since it's tough getting up to the mountains, so you might get a bonus for taking cubes up! It might make (thematic) sense to award all deliveries involving mountains (in either direction, or even just up top) and penalize those only in the plains (those deliveries being so easy, after all)? In that case, though, you'd probably have to bump up the mountain build costs a bit. - the odd tunnel connections also make it somewhat challenging seeing where the loops are. These issues are pretty minor, really (and that last one may even be a good thing!). It's a solid design that seems to work pretty well. It just didn't seem as innovative as I had expected, based on the use of the box bottom! Even the weird tunnel connections kind of remind me of the older Time Traveler expansions (in AoS and Railroad Tycoon/Railways of the World), where you can get tracks popping out of odd locations and connecting to other boards in weird ways. Overall a pretty good map, but not necessarily outstanding. I'd like to try the 5-6 player layout some time, too. Everyone else prefers Steam so we played with those rules (Base) instead. Should this play even be on this geeklist? Well, I'll leave it here for now.... We also may have gotten one rule wrong! We were awarding +3 for deliveries to Perth, in either income or VP depending on what the player chose for that delivery. The strict wording, however, could be interpreted as only giving an income bonus. Actually, I think we got it right. - Most blue cubes (2 per dark cities 1-6), start on east coast; ALL cities get 2 (AoS) or 3 (Steam) random cubes as well ... lots of cubes in the east! This game was ALL about Perth! Just as 1830PA is about shipping coal to the gray cities, this one REALLY rewards you for shipping blue -- you just have to survive the early game while you build your network! It may be even stronger here, since there's only one target delivery city! Four of us built in the east, where most of the cities are located and there were some turn 1 deliveries (even 2-linkers). Craig, though, built out west all by himself. He went heavily into debt in the early turns, but that's not nearly so bad in Steam! And then, before any of us could make the long cross-country trek ourselves, he was set to make long deliveries of blue cubes to Perth. He even built a helpful connection out towards us, so we'd be forced to use at least one of his links (initially) to get to Perth! And with all of us fighting each other for precious cubes and connections, Craig was even able to get Goods Growth (with a few blue cubes scattered here and there) a few times! He was just asking to be urb-bombed, and I complied by putting the blue city right next to Perth, on his main route in ... you're welcome! It turned out to be a pretty close game, with Craig just a bit behind me at the end. We were all able to eventually ship across to Perth, and this game is all about the blue cubes! Pretty enjoyable map, although I guess I need to play it with the AoS rules, too. Hopefully before we actually go to Australia! With just 3 of us, I wanted something made specifically for 3; but I couldn't find any! Well, I could, but it was one of those weird maps that Bob's not crazy about. But he does love all things Korean and I had thought this was supposed to be good with 3 or 4 so we gave it a spin! - every third turn, may not deliver from S to N, or N to S, or across border in either direction (except turn 10: no restrictions). At the time it was not clear whether this was intended to consider only start/end cities (how we played it) or entire delivery route (which is the actual rule). Bob and Peter both began building in the South, where all the cubes were. I started just north of the border, dipping below it only for one city connection in the beginning. Later, I built a little further south, but most of my network was in the north. Bob did later join me up there, both extending his own network and simply taking some key links from me. Very early, we had to decide what the border crossing ban meant. Having just played on the Alps map, I thought only starting and ending cities mattered. 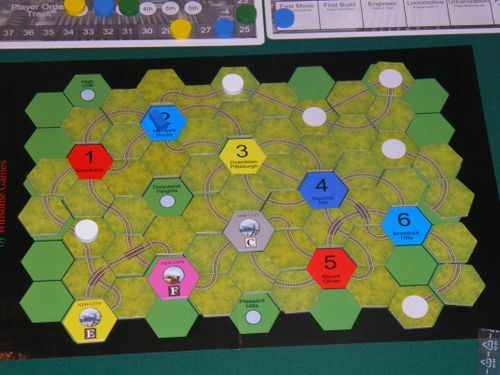 That is, that you could cross the border in any direction en route, but the starting and ending cities needed to be on the correct and opposite sides of the border according to the current turn's rules). This is similar to the Alps rule where you only look at starting and ending cities to determine if you get the +1 or -1 income modification. We all agreed, initially, that that made sense -- it would be too restrictive otherwise! But later, it became obvious that such a ban on border crossing wasn't really much of a ban at all! With my network largely in the north, the little dip into SK just gave me extra links to help make those long deliveries. But since we'd played the game one way so far, we decided to finish playing the same way and I ended up winning this *'d game! I was pressed for time (dinner plans for meatfest at Brasa) and we had 2 very inexperienced players, and I thought this would be a good map in those circumstances: it's AoS, but seems to be greatly simplified. - no income, expenses, or shares! - the player with the most money wins! We all went our separate ways in the beginning: Tracy in the SE, me the north, David in the NW, and Holly in the SW (in a spot, based on initial cube distribution, where there was a very nice loop in the making). Now why didn't I see that when I was building, just before her?! But yeah, I'll take credit for showing it to her -- she did, after all, win the game as a total newbie ... nice work! Anyway, early on we played on our own networks, although Tracy did a bang up job stealing my cubes from me while saving his own for later in the game! And Holly did very well saving money in the early game auctions. We did meet eventually, of course, and started fighting a bit more for those common central cubes. Surprisingly, the map works pretty well. The auctions are really wonky, though, since there is SO much money in the game. It still feels somewhat like Age of Steam. Or actually, maybe more like Steam? It's not bad if you want to play a very quick game, but I think it might be better with 5 or 6 -- so that more money gets sucked away in the auctions for turn order? Or maybe try this with Base Steam rules? Fresh from a Railways game! Finally, after trying all week! This is a WEIRD looking map. However, that is purely cosmetic. Functionally, this is equivalent to the much more typical one pictured here. 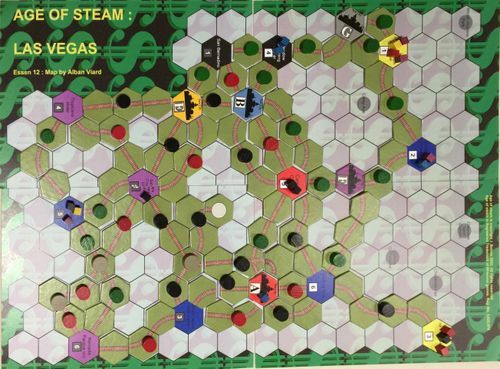 In our game, I (yellow) started in the center, Dan (black) in the center/north east, Luann (purple) in the north, and David (green) in west. Deliveries were difficult in the beginning, especially with those yellows and blues directly adjacent to one another! But the Fly Boat helped get through that early drought, even though we were probably playing it wrong (we assumed it was limited to deliveries for exactly 1 income). I think my initial builds ended up essentially cutting the board in half: since no one wanted to share deliveries with me, they built elsewhere; I had the south pretty much to myself! Luann tried a low-share strategy, keeping behind the rest of us for most of the game. But then, when she ran out of cash, she had to go big in debt -- she ended up maxing out at 15! David tried to build an east-west corridor, but corridors are not loops! Dan had a lot of trouble visualizing on this crazy map but still (eventually) did manage to build a loop. He also benefited from many of Luann's deliveries, where one link was his (he also used her link from time to time). However, my early income growth allowed me to keep winning the auctions when I needed to. That, and the fact that no one ever went south, gave me the win! 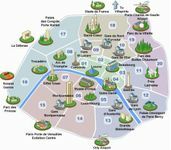 The Paris map is to Age of Steam what Power Grid is to Funkenschlag: the main difference is that routes are fixed and players just pay to claim them. But there is one other important change: the limit to claiming one link per turn (without Engineer). That makes it much more difficult ramping up income from early multi-link deliveries. The Fly Boat might be very good if it basically turns the river into a link (which, now that I've been thinking about it, is probably what it was meant to be). Overall, this is a pretty good map but I generally prefer having bigger rule changes, rather than just cosmetic ones. Eliminating track builds should, however, make this a speedier map to play. And in fact, the limited links and early deliveries are kind of interesting! I wouldn't mind trying this again, especially after getting some rules questions answered! I think I'll go ahead and try putting together a play-by-web version using Steam base rules (once I figure out how powerful the Fly Boat is, and where to put it in the turn order)! - Setup: New cities start with 1 cube on them. 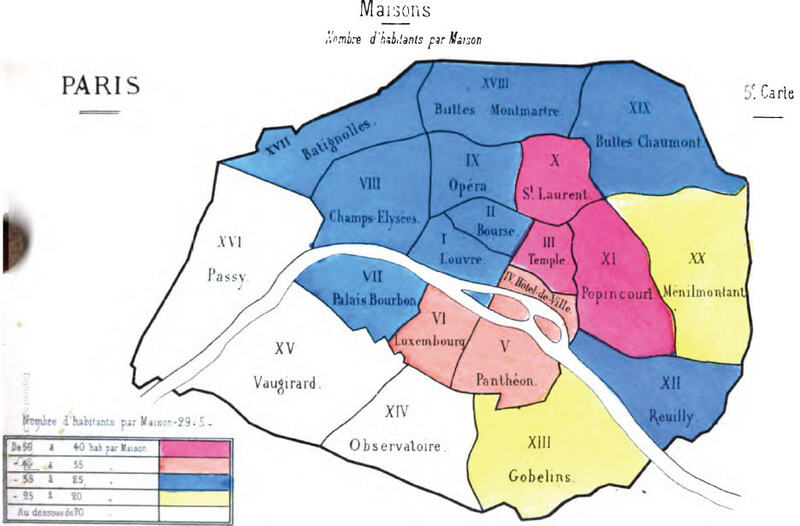 Colored districts along Seine get 2 cubes, not along Seine get 1 cube. - Turn Order changed to Fly Boat: allows you to move ONE cube along river; requires engine level 1 if going downstream, or 2 if upstream; only earns ONE income. I am NOT CLEAR if this is supposed to be the entirety of the delivery (which is how we played it), or if it can be just one part of a longer route. According to Alban, the answer seems to be the latter, a much stronger action. - End of game: We guessed district connections were worth 3VP since they cost $6 = 3 plain tracks in typical AoS. Looks like it's now been answered in another post for Alban -- we were right, 3VP each! Cyprus is an island nation with populations loyal to Greece and Turkey, and plenty of fighting between them. It was eventually partitioned, with a UN peacekeeping force there as well. In the game, players each take one of the 3 sides (Greece, Turkey, UNO). We randomly picked sides: I was Greece (yellow), Ken got Turkey (red), and LuAnn ended up with UNO (blue). L and I both started with 2 shares, just to be safe -- way too much for this map! Ken did better, only taking one share and avoiding bidding much in the early game. He kept that up much of the game, ending with only 6 shares or so (vs. our 11 and 12!). Luann started just west of center, building in Turkey North-South. I started building in the center, urbanizing and inadvertently creating an easy 2-link delivery for Ken! Ken also started near the center, building a bit into the Greek half but eventually spreading throughout much of Turkey. By the end, Ken and I had largely stayed on our own sides of the board, venturing slightly across the border to try to steal a cube of two. LuAnn ended up largely getting stuck on her side of the board, cut off from the east by Ken and my builds. I was able to get ahead in deliveries when Ken (finally!) had a run of turns with a cube shortage. He did finally build to the distant east, though, and found some good long deliveries! But he became profitable a few turns before L or I did, and the cash lead let him win every auction he wanted to win after that. And the huge difference in shares was too huge: I came close, but ended up 2 points behind Ken! - The asymmetric powers change every player's approach: Greece/Turkey need to largely build in the south/north (while reaching across the border to steal a cube whenever possible), while UNO can steal cubes from both but must play opportunistically as far as new cities goes. 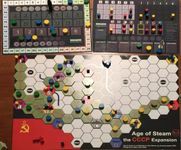 - The geography, with the long narrow board (though not to the extremes of Italy and Chile), also constrains builds -- can't let yourself get cut off from parts of the board! 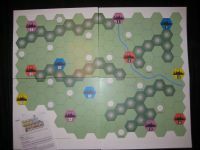 - Money is relatively plentiful: build costs are low (esp since you can only build 2 tracks) and, once you're through the early turns, income largely surpasses expenses. That's probably my least favorite thing here, since the early leader just continues to get the action they want. Maybe if Turn Order were changed to something else it would be better? - 3er only. The map shows a border between the Greek- and Turkey-controlled areas. - Players (randomly?) play as either Greece, Turkey, or UNO. 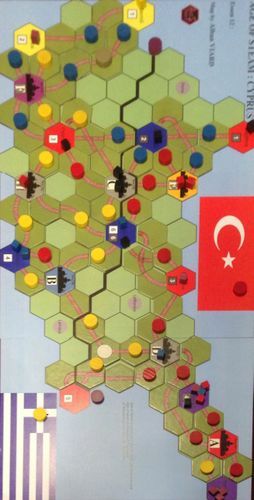 - Greek and Turkey players may only move cubes to a city on their side of the border (consider only final city). - UNO: No goods movement restrictions, but may never choose Urbanize. - Building Track: max 2/turn; 3/turn if choose Engineer. Pretty minimal rule changes, but the clustering of colors on the map make for an interesting twist. Luann won this pretty handily, 89-79(Christin)-75(me)-73(Bob), despite having to lose income early in the game. She managed to build a nice long path, get her loco up, and make some great deliveries! The set-collection rule had us all interacting in the center, and the income boost did help us get through the early game a bit easier. Nicely done, Luann! •	All towns accept black cubes. •	Towns only count for links when delivering black cubes; otherwise, ignore towns (no income, doesn’t count against loco). •	If moving a non-black cube through a town using more than one player’s track to/from the town, no player earns the income. •	Delivered red and black cubes are retained by the player (keep hidden). •	When chosen, may immediately exchange a previously delivered black cube for a red cube from the flag. •	Immediately place a red cube from the flag onto any city. o	Most black cubes loses. o	Most connections to red cities loses. o	If still tied, all tied players lose. •	Remaining players score normal VP; most VP wins. The initial layout seemed to be pretty low on 2-link deliveries but had plenty of 1's thanks to the black town rule. We all took just one share and bidding wasn't particularly high. I dropped early to see what the other guys would do: with them squabbling in the west, and with a pile of red cubes destined for black 5, I built there all by myself. The first few turns were OK, but then Bob and I got in a little bidding war (wrongly!) thinking the other wanted what we did. We both lost 1 income while Ken took a nice lead on the income track. He lost some of that lead in the mid game, though, as he eventually started having some difficulties with deliveries. Ken's tracks ended up being pretty linear, without a nice loop (especially with that cluster of purple cubes!). However, the early lead had Ken turning a profit VERY early in the game since he was able to keep his share count below either of us for the rest of the game. Later on, I think the lower share count and income bumps from we helpful comrades put him back in front! The early income growth did come at a cost, though: Ken didn't have a good way to get red cubes early on (although he had quite a pile of black cubes by the end!). Bob had decent deliveries from the beginning; when he didn't he and Ken often gave each other one income, too. 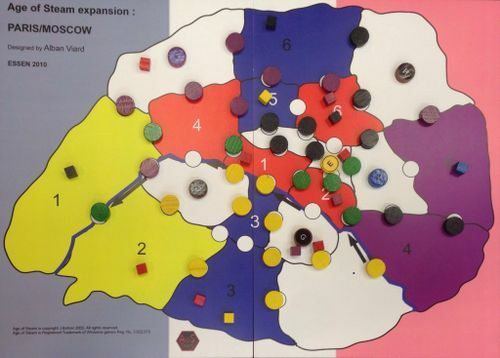 With both players networks intermeshed, they were able to take advantage of the early urbanizations to increase link counts (whereas my urbs included only one colored New City, and eventually 3 black ones). Bob also went after the red cubes pretty aggressively, both delivering and by taking Communism. He even "poached" reds in my network, giving me more income than himself (but less than my planned route!) but building his collection of reds. I built and played on my own half of the map for much of the early game. Of course, eventually the others did make some inroads into my territory, and I built an extension westward to get to that purple New City (I had several 5-link purples). I did occasionally have to borrow someone else's link but was able to almost always make that someone Ken, expecting him to eventually be eliminated from the running. I tried several times for Urb but was pretty much only able to get it later in the game after only black cities remained (I did get one blue, at least!). My link count was therefore a bit limited, but fortunately I had enough cubes to make up for that! In the end, Bob and I tied with 6 red cubes each; Ken, with only 5, was eliminated. That last red cube in New City C's display never came out! If it had, and Ken had been able to deliver it, Bob or I would've been the ones to lose the game (probably me!). Final income had me just 1 ahead of Bob but with many more track points (we didn't bother tallying it all up) for the win. - Having to collect red cubes to avoid elimination ratchets up the tension, although I think I would prefer to simply play with open holdings rather than bother memorizing everyone else's red cube count. - The town rules really slow down income growth! Locomotive becomes less important early on while urbanize is very important -- to help create multi-link deliveries earlier. All the non-black New Cities will get used early, amongst the initial track builds. That will leave a large part of the map with pretty crappy end-game deliveries! This also means that it is helpful to build close to other players, to benefit from any Urbanizations they perform. - The total cube count seems to be slightly low? I haven't done the math, but in the 3er game it may have been OK to end one turn sooner. • Production: if a player places red cube(s), also place a $5 coin with it (as in Setup). 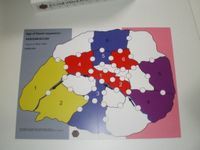 • If a Red cube is being placed onto the board, also add the $5 coin to that city. We all started the game going after the money -- those $5 cash payouts were very tempting! We were even moving cubes over mostly other people's tracks from time to time, just to get the cash in hand! You sort of have to do that, it seems, since cities are pretty far apart and 2-link deliveries, at least at the beginning, are hard to come by (especially with half as many urbanizations). At some point, though, you can't ignore the fact that you have to advance your actual income. Plus, the $5 sweeteners do eventually run out. After that, it's pretty much a regular game. The 3er modification of alternately eliminating Engineer/Urbanize is a nice change, though. - It's a pretty vanilla expansion with just a few changes. - Probably a good newbie map? Extra cash should help, and also provide some direction at beginning of game. - First Move becomes much more interesting than usual! The Rosewater print and play version, not the Bezier Games one. 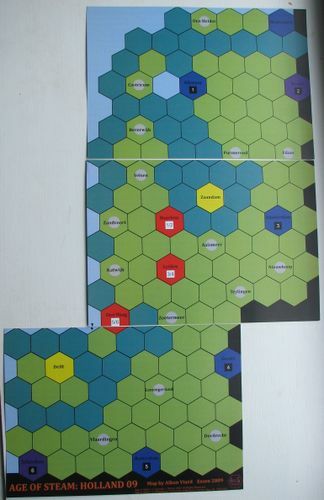 • For rounds 1 & 2, 2 players may choose Urbanize. • Roy Hill may not be urbanized. • Draw 3 cubes. Place 2 on Goods Display (as basic rules). May pay $3 (or $4 in last 3 rounds) to place the 3rd cube directly onto a city of your choice; otherwise, return cube to stock. • Roy Hill Station near Hamersley Mountains (Australia’s greatest iron source) receives 1 black cube every turn (if unavailable, place random cube), in addition to usual goods growth. • When chosen by the player with lowest income, may decide to replace with Subvention (announce decision now). • Subvention: May move a 3rd cube during Move Goods phase. Wow, Australia is BIG! And mostly empty, too. The game starts with most of the cities (and cubes) clustered in the east, nestled amongst the high-cost terrain — even higher here thanks to the high mountains. Everywhere else, the towns and cities are far apart. With the cube distribution at the start of this game, it was kind of difficult seeing any good early deliveries. Three of us ended up starting in the (south)east. It looked like Paul was planning to build up the coast, while Adam would build westward. Thanks to Adam’s turn 1 urbanization, I was able to build next to him and set up a 2-link delivery (assuming he decided to take his own 2-delivery, rather than just sabotage mine … which he did, thankfully!). Rodney and David built centrally, trying to get away from the early competition and set up some good deliveries for later in the game. They could also, of course, get a jump on connecting to the pile of cubes out west (Perth). Unexpectedly, though, Paul didn’t go north; instead, he came south to play with me and Adam! Of course, it may have had something to do with the fact that he couldn’t seem to win Urb, even though 2 people could choose it each of the first 2 rounds! So three of us were fighting in the southeast while the other two built centrally and west. Rodney had some difficulty getting deliveries initially, but bid high to get the Urb he needed to make some key yellow deliveries. Then, it was David’s turn to do some long-term planning: survive a few turns while building out to Perth. The other pile of cubes ended up in Roy Hill, with only Rodney having easy access. So he gradually worked his way out there while the pile of black cubes continued to grow. Paul did finally move up the coast (he did eventually win Urb) while I tried to build some kind of loop up there as well. I didn’t actually succeed in my loop-building — cities too far apart, not enough time — but I was able to find some cubes to deliver! By the time the last few turns came, Rodney had managed to turn his prospects around: Adam and I were leading, but with a pile of black 5-link deliveries waiting, Rodney had a real shot at winning while Adam’s longer deliveries were drying up. Rodney had been forced to issue more shares during his build-up phase. Later, when he held back on raising more money and I was able to win Urbanize (turn 6? ), I urb-bombed him and stuck black (D) one link away from Roy Hill. That totally tanked his game, putting him in 4th place in the end. I’d felt as if he and Adam were my primary competition for those final deliveries, but hadn’t really seen a good way to stop Adam; an urb-bomb, though, yum! I didn’t record scores, but final positions were: me, Adam, David, Rodney, and Paul. Especially good play for David, new to map AND the game itself! This seems like a pretty good map, although maybe not the best for new players. It’s also a bit tight with 5 players, although that may be exactly what you’re looking for! Subvention wasn’t used very much in our game, although I think in general it would be a good catch-up mechanism — especially in a tight game like this one. Overall, this is a good, tough map and a nice alternative to the Bezier Games version (Steam play above). •	Production: if a player places red cube(s), also place a $5 coin as in Setup. •	If a Red cube is being placed onto the board, also add the $5 coin to that city. •	If there is no blue disc on Production, place one there. Unfortunately, I didn’t take any pictures. They wouldn't have been interesting, anyway: Ted had a sensible build at the start, right in the middle of the board. Paul built nearby, and I built right amongst them. I had some kind of vague plan to use the Sherpa action to get to those piles of cubes, locked away behind a few little Xs! But I didn’t spend nearly enough time studying the board at the beginning. When I actually looked (AFTER the game was already under way! ), I had poor to no prospects for decent early deliveries! And the Sherpa action turned out to be not nearly as good as I’d expected. Spending your Action choice in order to move one measly cube (the cube setup, and my initial build, REALLY did not work well) just was not productive; not while others were urbanizing, or upgrading their locos, etc. Maybe it will be better when I cycle back around to this map (in 5-10 years?! ), although I won’t be rushing to get this back to the table. - The map is subject to poor cube distributions making it VERY difficult!